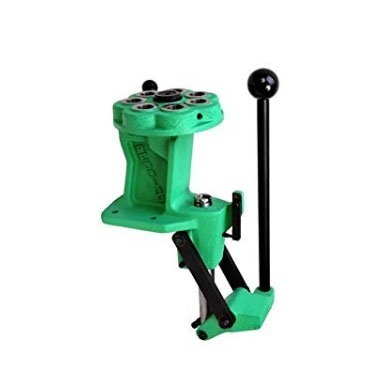 The T-7 Turret Press features a seven station turret head, cast iron construction, and powerful compound linkage. Its rear casting supports a rock solid turret for precise alignment. The T-7 incorporates a one inch diameter ram and accepts 7/8 inch to fourteen inch threaded dies, including the longer Competition dies. Additional interchangeable turret heads may be purchased. This is the only turret press we recommend buying. The Automatic Primer Feed Assembly sold separately. you can put your powder droper on the press and reload brass from start to finish without having the brass leave the press. Better speed for those field loads. When I need other calibers I just change turrets that are already set up loading. Things I would like to see change are better availability of the turrets from dealers. All our dealers say is conact redding. Poor attitude i would say. The next thing i would do to improve the use of the reloader is put more holes in the turret for the handle position. Three holes is not enough and when set up for 3 calibers it is sometime awkward to operate the turret to proper position due to the lack of holes in the turret for the handle position. Purchased this press when it came out and have used it a lot since. I shoot a lot of different things so I have four turrets fully loaded with dies. With careful organization you can do a lot of things on one turret: .308W Std sizer, a .308 SB die, a .308 neck die, a .30-06 sizer, an RCBS .30 comp seater, and a set of .204 Ruger dies. Two minor issues: the spring-loaded indexing ball is not captured so I have some spares for when it rolls under the shelves. The large bushing in the center might be slightly too long and the turret will rock back under pressure. Lapping it on a sheet of glass with 400 grit Wet or Dry soaked in oil will fix it (Redding support suggestion). This press is rock solid. I have used this press for about two years and love it. I reload everything from 6.8spc up to the 338 lapua mag and it works great. I would recommend this product to anyboby. For years I used a single stage press,it was all I could afford back in the early 70s and had to roll my own if I wanted to keep shooting.Now my kids are on their own and my wife is gone. I looked around and decided the T-7 was for me, like getting out of a Vega and getting into a new Caddy, Not cheep, but cheep help can get expensive. Best money I've spent in a long time! I've used this press to reload semi-auto pistol rounds. The 7 hole turret I have set up to run two - three pistol die sets along with a universal decapping die. I find this set up to be very accommodating for my efforts. I would like to incorporate another turret head for rifles dies and also have an additional universal decapping die on it. This press has no problems sizing pistol brass, decapping crimped primers or seating bullets. I am pleased every time I use this press for each step of my reloading process. When decapping brass I notice the tendency of spent primers coming out of priming arm slot (I've incorporated a step of placing the back of my hand in this area to stop primers from flying out). When seating the set screws on dies I find that the die has to be back out so my allen driver can rotate with enough room. Absolutely love this press. I am a professional gunsmith and retail gunstore owner and this is the press I use. Really like this press for the ease of use and the simplicity. Having used my RCBS Partner Press for 20 years the Redding T7 is a real treat. I like the room you have to place in shells and projectiles and hold them as required. When decapping there are no dropped dead primers and all go into an easy clean tube. I also purchased the primer feed system and find it works very well with the press setup. Overall, could not be happier with the press and primer feed. Another great product from Redding. This is a "one stop shop". Does everything I ask it to do. Don't buy anything less when you can get the BEST ! I've been reloading using mostly progressives of various makes since the 1980s but none come close to this press. It is very precision, smooth as glass, and simple to use. It's not as fast as a progressive but much more quick than a single stage and is much more enjoyable to use than either. Didn't think this would make me give up my Hornady LNL AP but I sold it to a friend after using this press. It's that good! I can't be more disappointed. I have heard for years that Redding makes top of the line stuff. I purchased a T7 with 4 redding dies and their top of the line powder measure....about $800 dollars of stuff. My first complaint is the powder measure. When you place the rubber cap on, because it's air tight, it forces air through the bottom of the hopper and powder goes everywhere. Then there are the dies, strips and flakes of brass from everyone, my thumb and forefingers are covered after a 100 rounds of reloading. Then there is the competition seating die.....supposedly you can control the COL to +/- .001, not true. I'm getting as much as .012 variance between rounds....Berrys .230 rn, xtreme.230 rn, winchester .230 clad rn...it doesn't seem to matter. My COL's are all over the place. I have to load every round tall, check it, run it through the die again, check it, adjust the die, run it through again. It takes forever and a day. The T-7 is built like a tank, however as a system with redding dies, it just doesn't work for me. I shouldn't have to stop every 25 rounds to clean brass out of all my dies. I Think expecting COL's within .002 without adjustment is reasonable. I shouldn't have to sweep up powder just because I added added some to the hopper. most accurate and strongest turret press ever commercially offered to the public. RR from San Diego is a novice and doesn't really know much about handloading. I prepped brass for my dad in Nevada in the mid 60's using a heavy C frame and a remarkably good Herters O frame press. I bought and used Lyman presses in the late 80's - the Spartan turret being my mainstay. I upped my ante a few years ago with Redding T-7 Turret & Ultramag presses side-by-side on my bench. One will check runnout with the other. + or - .0005 (1/2 mil). I'm an old Jarhead from Pendleton. RR from San Diego needs to check his runnout. Problem might be with brass deviation or sloppy shellholders. If there is a machining problem call Redding and they will make things right. My customer service has been very good with Redding, RCBS, Lyman and Lee. Everything about this press is fantastic. Ease of operation. The optional priming system is easy and quick althou I do recommend the 2nd primer slide to have both large and small primer set up with ease. I use mostly as a semi progressive with a case activated powder measure. It is massive yet smooth. I bought as an upgrade to the single stage and to help speed my the process. I am impressed with the built quality - the press is strong and accurate in terms of moving from die to die. It is perfect for my usage as I will be using the 7 station turret plate for 2 sets of dies, 357 and 223. One little issue i see so far is the priming system, that it would occasionally have an old primer sitting inside the shaft instead of falling into the plastic tubing as designed. I would rate this a 4.5 star and highly recommend it to others. This press is amazing! I started with a press that uses bushings to hold dies... it worked but i wanted something that took less time to get a complete rnd. very accurate, very solid, very satisfied. Although Brownells shipping could use some attention... they lost my order, then found it, then lost it again before shipping it out to me. I've been using an older Lyman Spar T turret press for years and I really like it, but I decided to upgrade to one with the more modern compound linkage, rather than yank and pull on what I had. After looking over the Lyman T Mag and the Redding T-7, I opted for the Redding T-7 and being on sale put it in the same price range as the Lyman plus an extra position. Very well made, as are Lyman products, but Redding's are a bit more refined. I use it for rifles loafs as I have a Dillon 550 for handguns. If I had one criticism its that the hole for the turret handle should be at every position. I am the type of reloader who FL sizes my brass back .003 - .004 for semi auto and .002 for bolt rifles. It is tedious setting up sizing dies.... I used to spend a lot of time doing set up on single stagers. When i had my first kid a couple years ago i realized i don't have time for taking stuff down that i just set up. I took the plunge, spent the money and went with this press. It is the best press ever IMO. I have my personal record groups with this press. I have saved countless hours not wasting time, screwing and unscrewing dies in and out. At this time i have 2 FL sizing dies for 2 different rifles, 2 bullet seaters for 2 different rifles, a Lee factory crimp die and a Redding instant indicator installed. I keep my single stage press for regular de capping use, and bullet pulling when need be. I can't recommend this tool enough. If you have a family and not as much time as you once had, if sometimes you feel like you have more money than time etc. I have had zero success with this product.The feed system is not smooth at all and due to the oversized feed tube the primers get flipped in the tube. For every one that is properly oriented 5-10 will be upside down. You are better off loading primers one at a time then to expect this tool to feed correctly. The T-7 Turret is a great press but the Auto Primer Feeding System is severely lacking. Save your money. The auto primer works for me, no adjustments to be made,if you install it right , it works right.I did also get an other sliding primer arm assy. this way you can you can have one with a large primer plug and one with a small primer plug and you don't have play around with sleeves and springs just to go from small to large primers.It comes with small and large primer tubes,don't put small primers in the large tube or they will flip around.Why would you want to handle a primer if you don't have to. Get some extra tubes also,it will speed things up.The extra tubes I ordered didn't come with the holding clips, had to get them at the hardware store,this should change, it's a 10 cent clip,why don't come with the tube? This is still a great system,make sure you push and twist the tube after you pull the pin to make sure it is seated,if you use it right it will work right.Good luck!! I don't agree with an earlier reviewer. The primer feeding system works. The height of the primer cup on the slide bar is important. Make sure it is level with the primer retention pin and the primers will easily load perfect every time. Also, the primers stay in the collection tube unlike the Dillon Precision priming system. And of course, make sure you choose the correct size collection tube for large or small primers. I have used it for almost a year now with no issues. I did purchase an extra slide bar. One for small and the other for large primers. Eliminates the need to switch out the primers cups. The only drawback that I have noticed is the tube can get in the way. Easy to get used to however. I have used about every priming tool around and have never had any trouble with any of them. This one I could not make work. It was by far the highest quality in a priming tool I have used - well machined and quality materials - no plastic. I never could make it feed a primer into the priming arm. I never tried the small primer tube. No point. There were other problems but I could have worked them out. Bottom line is if primers don't feed smoothly it isn't worth it. I've been using the T-7 Turret Press for about 6 months and have reloaded about 2000 223's and and about 2000 9mil with the hand priming system that comes with the press. I was putting off purchasing the auto priming system because of the feedback in the reviews, but recently went ahead and bought one. I wish I had bought one sooner. I've used it with about 500 small primers without issue. It holds 100 primers and twice I tried picking up 10 wondering if I could load less. They fell through the tube into position easily. I was careful upon installation to follow the directions. I think that is key to my success. I also like it that I can pick up primers right out of their factory retail tray. The tube fits perfectly in the package tray hole. Make sure you use the proper primer tube. The outer diameters,for both large and primer tubes are the same. The inners are different. I have loaded primers into about 1000 cases, so far I have been very happy with it. I had a very minor issues in the beginning, I didn't follow the instruction too well and didn't get the height of something right. I am going to buy a second arm, one for large and small primers and never a problem again. Don't be a idiot like I was and not realize that the steel tube is for protecting the other tube with the primers inside and screws off and on. I don't understand why others rated it low, works great but you need to read the instructions.